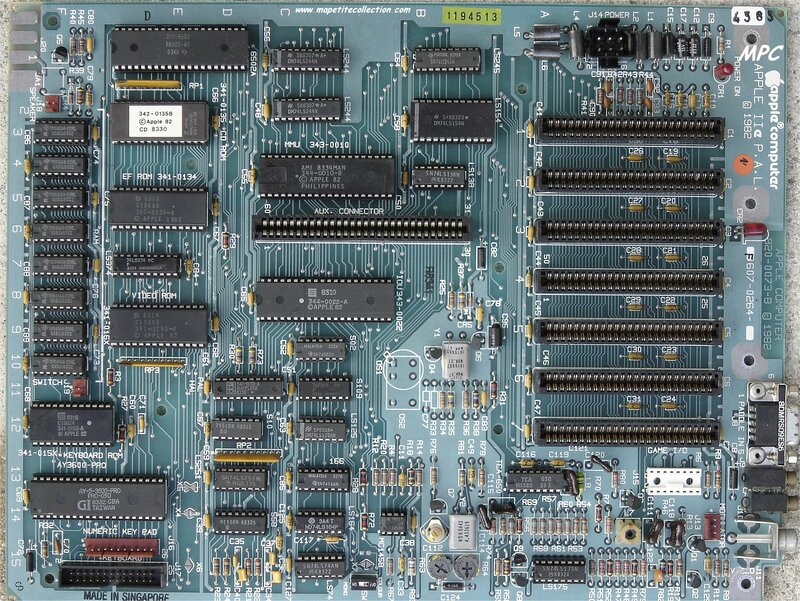 The Apple II architecture supported 7 memory-mapped expansion cards which could be optionally installed towards the rear of the motherboard in individual expansion card connectors. On the Apple //e, there was an additional 8th "AUX" connector which was an expansion connector typically used for adding bank switched RAM that also enabled the ability to use 80-column and double lo/hi-res graphics modes. From a memory-mapped systems point of view, the AUX slot was accessed in the same way that one would access the standard "slot 3". As a result of this, there are very few cards which would work in slot 3 when there was also an expansion card installed in the AUX slot since they could conflict in their memory-mapped address space. An increasingly now common example of this exception is the Uthernet II card is capable of being usable in the slot 3 of an 80-column enhanced //e since the Uthernet II card does not use the memory-mapped ROM space that the 80-column card requires. So this background being said, the original NTSC / North American release of the Apple //e had the AUX slot off to the left of the motherboard next to the power supply. It had no physical interference to the front or rear of it, so some cards designed for this slot could extend nearly the whole length from the keyboard to the rear of the machine. However, the PAL / European release was slightly different in that the AUX slot was inline with the standard slot 3. While I'm sure there were circuitry differences to support PAL video, I'm not sure why this required (or the designers chose) to move the AUX slot from its original uninhibited location near the PSU? Does anyone know a reason for this? I'm not sure why this required (or the designers chose) to move the AUX slot from its original uninhibited location near the PSU? Does anyone know a reason for this? I had the same question back when the IIe was new, and I've been told by the lady responsible for PR at Apple Germany, that it was made to avoide people using their old 80 column cards while an aux card was plugged in. It had no physical interference to the front or rear of it, so some cards designed for this slot could extend nearly the whole length from the keyboard to the rear of the machine. Nor is there any interference when it's in line with slot #3. The connectors are both of equal height, thus any card that would extend all the way back could fit as well in a PAL unit - ok, it may have like 2cm less space, as the aux slot also moved a bit toward the back - then again, I can't realy remember any card for the aux slot ever extending all the way back.